Use the code PCG to take 20 percent off ticket prices. After working on titles like Arma and DayZ, what do you think a Bohemia Interactive developer would do in their indie dev career? Create a strategic Transport Tycoon-alike known as Mashinky, then show it off at the PC Gamer Weekender, of course! 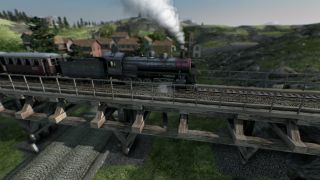 Mashinky is the brainchild of Jan Zeleny, indie dev and employee at Bohemia, and it’s all about creating your own transport empire across a procedurally generated map. A blend of realistic graphics, an isometric construction mode and boardgame-like rules helps it to stand out from the crowd—which you’ll be able to see that for yourself at the Weekender. If you want more information on Mashinky, check out the game’s official site, keep up to date with ongoing dev matters on Jan Zeleny’s Twitter, and if you want to play the game—it’s currently in Early Access—you can pick it up from Steam (where you’ll see it’s enjoying very positive reviews). As well as Mashinky, you’ll also be able to see many more speakers, games and booths all at the PC Gamer Weekender, which is being held February 17-18 at the Olympia, London, in the UK. For more details see the site, and follow us on Twitter for up-to-the-minute news. Tickets are available now from £12.99. Use the code PCG to knock 20 percent off the ticket prices.